As Government ministers and highly-paid fire chiefs cavort about on holiday beaches, 181 Tower Blocks in 51 areas of UK have so far failed fire tests, putting over 20,000 residents at risk of being burned alive in their beds or suffocated by highly toxic hydrogen cyanide gas, as they sleep. 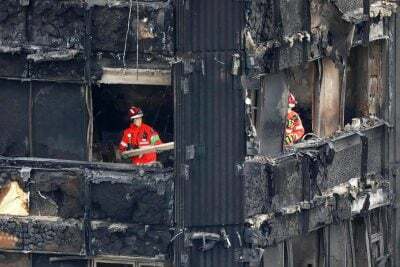 It is an unprecedented national scandal in Britain today that Local Authorities up and down the land have abdicated their basic responsibilities and allowed architects, contractors and developers to clad residential buildings, schools and hospitals in insulating materials that have been known, since the 1970s, to be highly dangerous, poisonous fire accelerants. In these fetid, money-grabbing, profit-orientated, back-handing, deal-making, high-salaried, council offices of today’s local and central government with their fire security chiefs and building inspectors – the safety and well-being of ordinary citizens have been contemptuously dismissed. Where is the legal responsibility, traditional civic duty and pride? What has happened to make us a Britain in which tens of thousands of ordinary citizens go to sleep in fear for their lives? The United Kingdom needs a ‘root and branch’ clear-out of so-called public servants, many of whom have enriched themselves at the expense of the lives and well-being of those they are paid to serve. It is a national tragedy, the depth and extent of which is only now being recognised. The obvious way forward is a General Election to bring in a national democratic government that will ensure security and safety for all British citizens regardless of their social standing or family income. Then maybe Britain will become once again, great and proud, with a national and local administration that together works in the public interest as the elected representative of the people, and not as politicians who put harm in the path of those who elected them.